Folding knives have been around since the Roman empire, and the Vikings had some beautiful ones. A great looking Roman era folding knife is shown here. 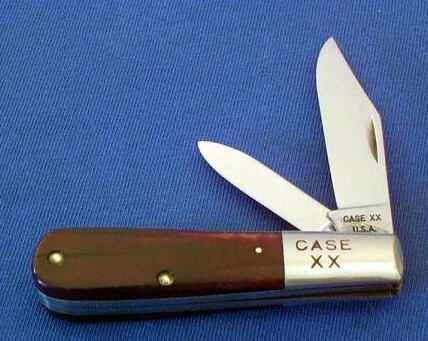 Pocket knives were popular as a picnic item, with folding forks and spoons. They especially became popular when pockets became popular in Europe. They are also popular for trimming quill ink pens, from which the alternative name "Pen knife" arose. Knives which used a spring on the back to hold a blade in the closed and open position came into use at least by the 16th century. Barlow Knives were popular in early America, and continue to be made. 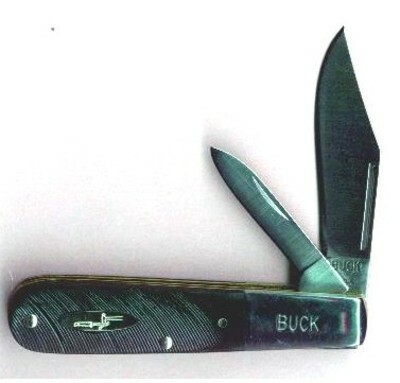 Lock back knives were perfected around the turn of the 20th century, and many models were available. The diagram below shows the parts of a typical spring back pocket knife. This combination of blades is called a Scout model, and many Official Boy Scout knives are made in this style. The region aroung Mora, Sweden, has been known for centuries as a source of quality steel articles, including knives. About 110 years ago Erik Frost began making knives and developed a style that became popular. This general style of knife is called a Mora knife and is still made by two companies in Mora that trace their anscestry from Erik Frost. The companies are Frost Knivfabric and Eriksson Knives. Mora knives have become a favorite for all outdoor activities, including Scandinavian construction workers, foresters, and is a real favorite of survival and bushcraft folks. 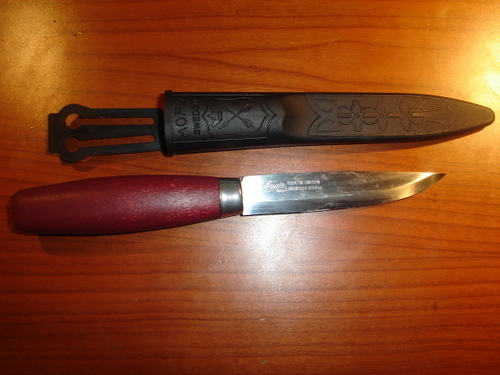 Mora knives come in several variations, with plastic handles, in a version with a laminated steel blade, and in the traditional wooden handle handle shown above. I learned about Mora knives from my friend Bryan, who told me and my backpacking class about the reputation of Mora knives being used to cut down trees by pounding the full tang knife into the tree, then pounding it back and forth to cut wood fibers. It is also reputed to be able to be driven into a tree, then support a man's weight on it. That seems like a stretch to me, but you'll find reference to people testing that claim. On a hike the fall of '06 we found a tree that had a cut off branch wound that had become fat wood, from saturated and dried sap. We used a rock to pound Bryan's Mora knife into the hard wood to chip out lengths of fat wood. Not many knives would take that kind of abuse. The more inportant thing is that the knife comes wicked sharp out of the box, holds an edge, is easy to sharpen, and is tough and durable. My Mora knife has a snug fitting plastic sheath, and can be worn on the belt or hanging around the user's neck. It has laminated steel, with the center steel being harder, sandwiched between two layers of softer steel. The combination results in a knife that holds an edge, and is very tough. The knife has the traditional Scandinavian bevel on the edge, rather than being hollow ground like a lot of knives. To sharpen it, you put all the metal of the bevel portion on the stone, and remove metal from the entire bevel. That means removing a little more metal, but it also means that the angle set at the factory remains constant after many sharpenings. Being a backpacker, I'm more used to Swiss Army knives and folders than fixed blade knives, but having a razor sharp fixed blade knife makes some camp chores go well, like cleaning fish and fire building. Its very light, and now I wouldn't think of hiking without it. The big surprise is.... it sells for less than $20, and often closer to $10. You'll see Mora knives on ebay, and knife sellers on the web. Get a Frost or Eriksson Mora knive and let me know how you like it. The best designs are the ones that make you say "I wish I'd thought of that!" They are also usually dead simple, and probably quite a bit more subtle than they appear. The Press-Bot coffee maker is all that, and it makes good coffee too. Camp coffee is always great, but coffee made from grounds in a French press is wonderful. 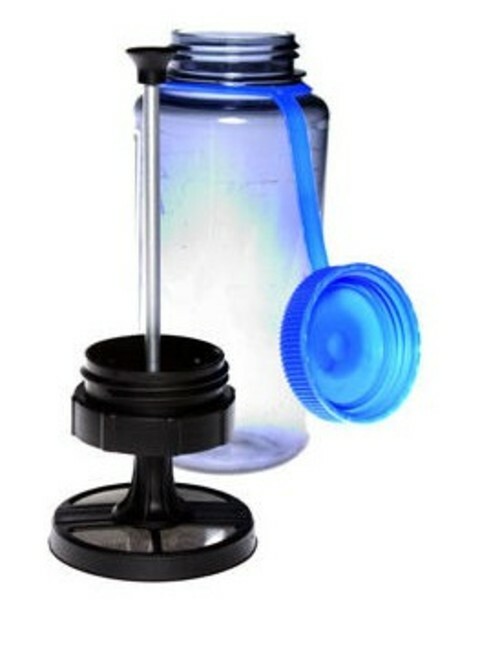 Since the Press Bot operates with a standard 1 liter wide mouth Nalgene bottle, that means you can make enough great coffee for three or four people at once, so it is also a very efficient method. This summer I was at Kane Lake in Idaho teaching my son to fly fish, sitting on a rock having a great cup of coffee. It doesn't get any better than that. 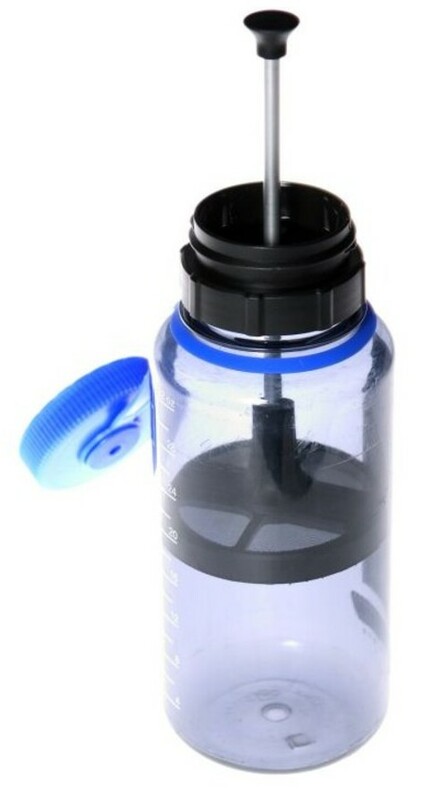 This little gadget weighs only a few ounces, and I carry a Nalgene bottle anyway, so it is very practical even for ultralight hiking. 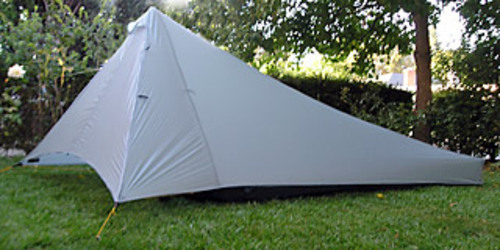 Henry Shires at Tarptent, makers of innovative ultralight backpacking tents, was inspired by the design of the 1891 canvas tent below to take that design and improve it quite a bit. "The key improvements over the 1891 shelter include the integrated rear carbon fiber struts, catenary ridgelines, swept "wings" which better stabilize the tent front, do away with any center stake or guyline and add gear storage, and the copious venting with full bug protection and integrated flooring. Not to mention the weight, which at 1.5 lbs is superlight." This tent is called the Contrail. The pole for this can be a single a hiking pole, a stick found on the trail, or you can take a very light 2-ounce pole. There is no front guyline to trip over or duck under. The headrom at entry is excellent, as is the elbow room (66" across front door) and rectangular foot room. The width of the floor eliminates any chance of the bag contacting the walls, and leaves room for a dog to join the boss in the tent. There is excellent ventilation as the back wall can be folded open, and the packed size is tiny at 14" x 4" x 4". The tent is a stretched pyramid design with end corner 14" carbon fiber struts, which fit in protective sleeves. The rear floor edge is inset 10" from the tent dripline. Setup is extremely quick, and uses only 4-stakes in the sub 2 minutes setup time. Front beak provides 10 square feet of protected gear space. The high beak vent allows flowthrough ventilation. The rear storm flap rolls up or down (from inside) as needed. It also suppports tip side up or handle side up trekking poles (not shown in these photos). 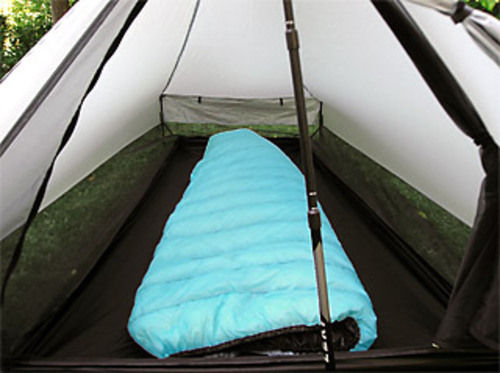 The 7-foot floor cradles a "long" sleeping bag (shown) with ease. 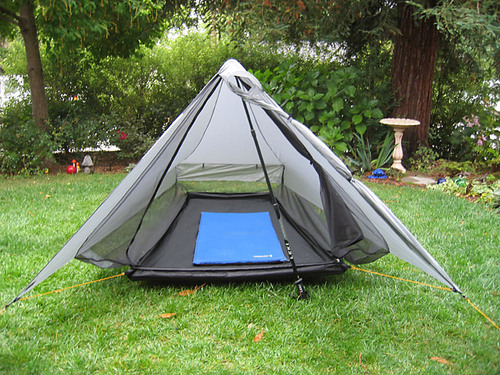 At 1.5 pounds, this makes a great weatherproof ultralight tent. "General" Mountaineering Not Well Served By Modern Ice Axes. Ergomomic Analysis by a New Zealand climber provides evidence of a wrong turning in technical change. Brian Wilkins, a mountaineer from New Zealand, has some thoughts about the history of climbing equipment, and especially ice axe length. 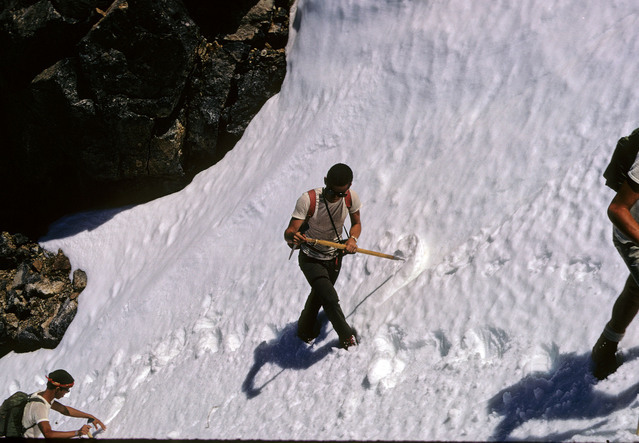 Old timers may remember when ice axes were about waist high, as shown in the photo below from 1970 of a party ascending Mt. Banner in the Sierra Nevada. Short axes are not as new as many believe. When the waist-high axe, with which Everest and virtually all our own mountains were climbed, supplanted the chin-high European alpenstock, it didn’t have things all its own way. Geoffrey Winthrop Young and J.P. Farrar, discussing an 86 cm axe in 19141 , state “Its lightness and shortness have advantages, especially for one-handed cutting on difficult steep ice. But it cannot be used as a third leg, as can the normal axe, and the climber carrying it must be a very good technician with his claws2 since it is of little use for long heavy cutting of steps on big mountains. 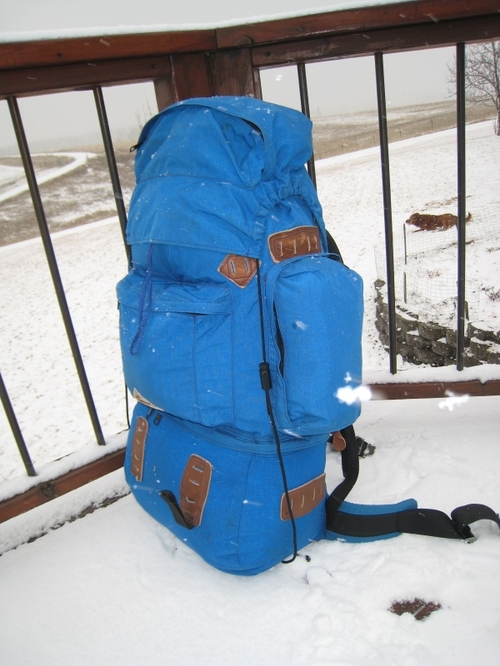 Nor has it the merit of being much lighter in hand, since it has to be made solid and stout enough to serve for safe rope-belaying and anchoring on ice and snow”. They also mention an axe, popular with some, that, for carrying, can be taken apart at half its length and which, because the strengthening made it heavy and unbalanced “is only usable on mountaineering where the major effort of the day is spent on rock, and the ice work is only occasional or simple”. For winter climbing in Great Britain they advise two shorter axes, one of 48cm “ suitable for gully work and stout enough for “gardening” “, and another, even shorter “more like a pick hammer” “for Scottish verglass and waterfall ice”. Nor is the front pointing two-axe technique new. The great guide Peter Graham relates3 how he overcame a twelve foot wall. “ On probing this I found a thick covering of frozen snow but it was too steep for cutting. When Mr Sillem asked me what I thought of it I said that if I could have his axe I thought I could manage it. With one axe in each hand I drove the shaft of each in turn as far above my head as possible, and pulling myself up on the axes kicked pigeon-hole steps with the toe of my boot. Every few steps I shifted the axes up a bit and so on to the top of the wall. When I had gained a firm stance, Mr Sillem was able to come. As he reached the top he asked, “Who taught you that trick?” “Mr Newton, I replied”. Canon Newton first climbed with Graham in 1903, having come from England after five seasons, mostly guideless, in the Swiss Alps, and is recorded4 as having passed on to Graham his knowledge of safe climbing. I don’t know how often Graham used two axes, but fifty years later the one axe method was certainly the normal technique. Graham had a good deal of contact with Northern Hemisphere climbers, and would have known about short axes, but nowhere is there any indication that he doubted that his long axe was best for the work in which he built up an impressive record of accomplishment and safety. Frank Alack, another great New Zealand guide wrote5 “Over many years I have tried a number of makes of ice axe and in the main found them too light”. Grivel added “front points” to crampons in 1932, but it was only in combination with Chouinard’s modifications of short axes, and their manufacture by Charlet in the 1960’s, that a new technique came into prominence. Steep ice faces, short and long, summer and winter, became the playground of the new two-handed exponents who by now have a range of specialised hardware, and a literature describing their impressive accomplishments. But not everybody is willing or able to climb facing inwards on their toes while putting their leg muscles to such a severe test, or to wear stiff plastic boots to help alleviate the stress. We know that the vast majority of the climbs in the Southern Alps don’t call for specialised techniques. Why therefore, if simple cramponning is not possible, should mountaineers forego the comfort and security of a line of steps, however narrow, knicked where necessary in these slopes with an ice axe of convenient length? Two recent6,7, and one not-so-recent8 , local publications present themselves as candidates for my manual; Alpine Skills7 claiming to be a “new edition” of Mountaincraft, but with less than half the 57,000 words of the 1987, the previous, version; Mountaincraft8 itself is the second, and the third, A Climber’s Guide to New Zealand Mountaineering Techniques6 a slim book of 11,000 words. None of the three claim to be written primarily for anyone other than the “general” mountaineer, but since they describe the ice axe as “commonly 70cm”7 , or “normal length…about 70cm”8, thus excising a major chunk of our collective memory without explanation or discussion, we must put a few questions to them. The third book6 depicts shortness only in the form of the apparently stretchable shafts present in diagrams, a tricky feature also of ref.8. Having accepted the shorter axe without explanation, they already have difficulty defending their candidacy for inclusion in my manual? But their problems are only beginning. 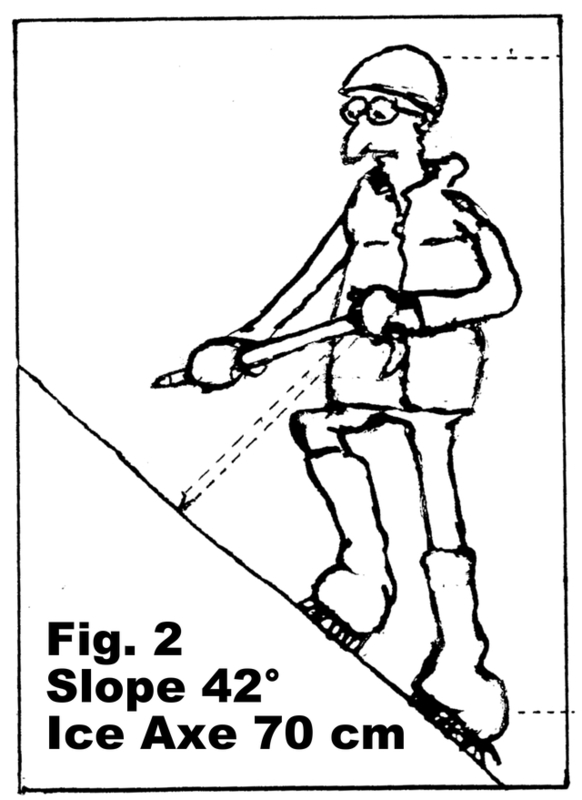 In the descriptions of the deployment of the axe across the body, where the head of the axe is held in one hand and the other is some distance down the shaft, we read7 “ an elegant and efficient bracing method when you have a moderate to long-length axe”, and “ is mainly used for traversing steeper slopes and is best suited to longer axes”8, and “ used for moderately steep terrain…the axe in the brace position as a ”third leg” for balance”6. So far so good, but the language is loose. How long is moderate to long? How steep is “steep” and “moderately steep”? Avalanches can slip off slopes as gentle as 150. We know that lives are lost on what are classed as moderately steep slopes. A great deal of the information in these books is conveyed by means of diagrams and photos with plenty of detail, including angles in relation to the slope, the climber, and the ice axe. It is profitable therefore to look at the angles in our climbing environment to see how they match what is published. The angle of rest of scree, of which we have plenty, is commonly about 320, as is the angle of the snow or ice that might be covering it. Calculations, using the contour maps now available, allow us to find the angles of many of the slopes and ridges on which we climb (Table 1). It is worth noting just how much of our climbing is carried out in the thirty-something degrees range. 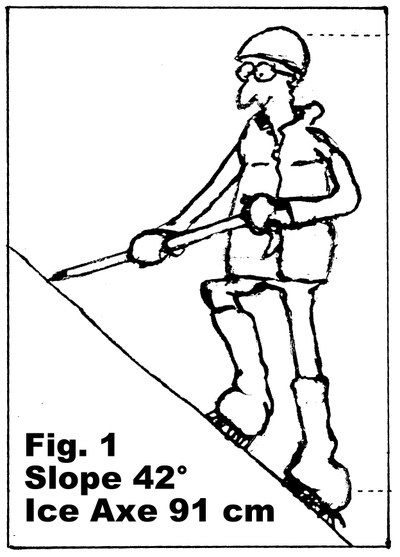 Yet our three books, with a total of ten measurable diagrams in their ice and snow sections, depicting climbing with one axe, portray slopes of approximately 80, 55, 38 7, 31,42 6, 33, 50, 45, 43, 618 degrees, only three of which fall within the range of the slopes in Table 1. Why this selectivity? It can’t be that the slopes in the 30’s are too safe to worry about: we know that is not true. 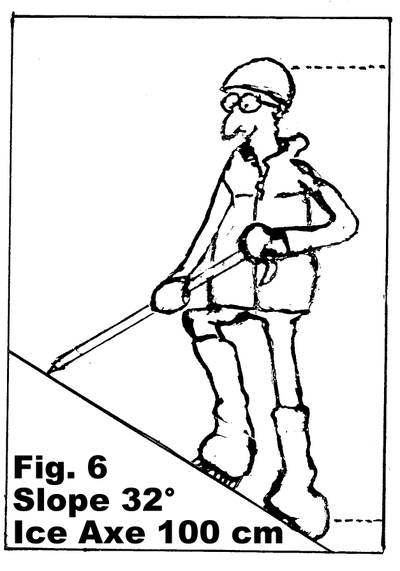 If, as we also know, these books are for the general mountaineer, why are we not shown a climber using the ice axe as a third leg, a firm cross brace, in the most common situation in all our climbing, traversing scree, snow, or ice, of an angle, say, in the low thirties? We know that good balance greatly enhances safety as well as reducing fatigue. “Place the ice axe across your body with the spike on the slope and the shaft as near as possible to the horizontal” (italics mine) is the good advice in one book7. A near horizontal shaft pressed down on the slope offers a stabilising levered force capable of being varied constantly in response to our movement, to the buffeting from wind, and to the varying stability of our footing. The contact with the slope is necessarily away from the body and, for balance on the move, is greatly superior to one in which the axe is pointing more or less straight down into the snow or scree close at hand. However, as in the other two books, none of this advice can be acted upon using the short axes that they endorse. In fact, if they had attempted to portray it with dimensions approaching some sort of accuracy, it would have looked embarrassing. Fig. 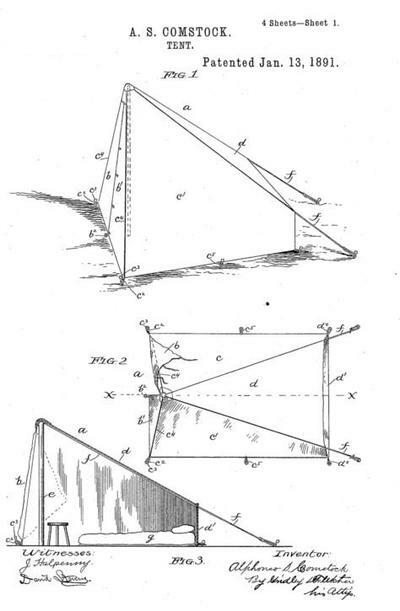 1 is redrawn to the proportions and slope angle of the only diagram in ref.6 that shows “third leg” bracing. 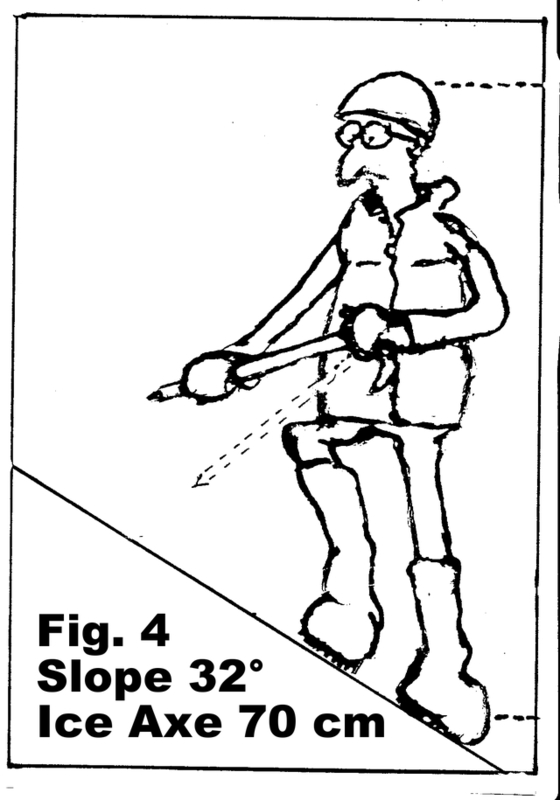 Assuming the climber to be the height of an average NZ male, 175cm, the ice axe, in order to reach the slope, must actually be about 90cm. What if we place a 70cm axe in his hands? Fig.2 shows the problem and the impossibility of an anywhere near horizontal shaft. In Fig.3, with the 100cm axe, everything is a little better. Again the almost vertical contact, even of the 91cm axe in Fig. 5, is undesirable. But what happens to bracing on slopes that are other than very steep? Ref.7 avoids depicting it. The problems appear when we look at 320 slopes, the most common and realistic situations of the lot. The 9 cm shortening, as in Fig.5, has a major influence on the angle of contact with the slope. Note that Figs. 1, 2, and 4, show the hands a little further to the side, away from the centre of the body. 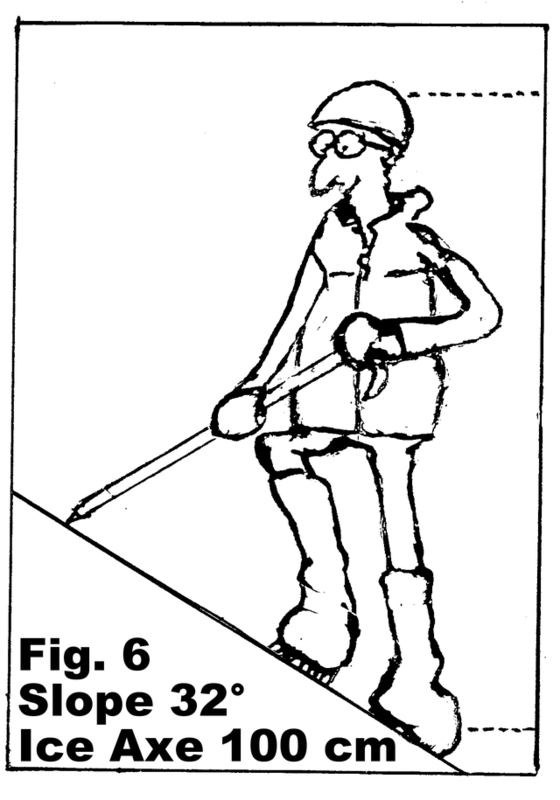 Fig.6 tells us clearly and unequivocally that it was not by chance that climbers adopted the waist-high length, and not merely unthinking conservatism that kept them using it for a century. Therefore my manual will include a selection, from the literature, of the photos I now see of climbers in all manner of awkward postures; bending at the back and the knees, twisting, leaning, crouching, displaying the impositions of the shorter axe. I will also show photos of climbers in exposed situations, holding their short axes in one hand on the uphill side. No wonder an Everest climber complained bitterly about the short axe that had been recommended to her.9 Alongside these I would place illustrations of climbers, not only on the steepest slopes, but on slopes including those of around 350, going about their craft with waist-high axes that are not too light, moving with easy balance on tussock, scree, and rock, and, on ice and snow, cutting or nicking steps, and preparing stances, with poise, probing easily for crevasses, and establishing belays with the shaft driven deep into the snow10 should it be soft enough. The waist-high axe is not, of course, for the specialist rock climber, but that problem was dealt with a century ago. Even the 70cm axe will tend to get in the way. I recall axes being passed among our party while rock was being negotiated, and pulling my 100cm axe up on the rope after climbing a rock pitch. But for the general mountaineer the longer “third leg” can be of great value in many rock situations, such as moving along near the crest of ridges, and especially during descent. The waist-high “third leg” is also indispensable in bush. While I will encourage climbers to practise self-arrest, I will also help them realise that the surfaces on which they are most likely to slip, for example snow over ice, are also those on which they are most unlikely to arrest a fall. The emphasis should therefore be on avoiding falls in the first place; hence the paramount importance of balance and posture, as discussed earlier. The primary arresting method has the hand driving the pick, not the shaft point, into the slope. And because the hand-over- pick position is exactly that required in the previously described two-handed bracing against the slope, it is well set up for the quick response that gives the best chance of success. It should be clear from the diagrams that holding the pick in against the slope while traversing is not an option on anything but the steepest slopes. My manual will also bring back the glissade in the form in which it can be enjoyed with ease and control. The handbooks generally describe three methods, recommending control with the axe for the sitting and the crouching methods (the two most awkward and least controllable methods), but, for the obvious reason that the axe is too short, not for the standing method. Just how messy the situation has become is illustrated in the Seattle handbook where we see a climber executing a standing glissade, holding the ice axe out in front (italics mine), while we read these challenging, unnerving, words in the accompanying text “The standing glissade is the most comfortable, elegant, and efficient method which permits the most effective method of steering and turning. It also gives the best view of the way ahead. 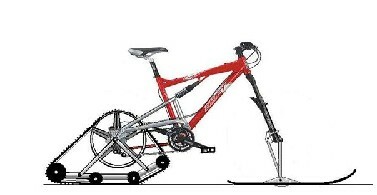 To slow down put more weight on the heels by rocking slightly back to dig them in”. Ref.8 attempts to combine the standing glissade with rear braking and the shorter axe, all on a steep (450) slope. 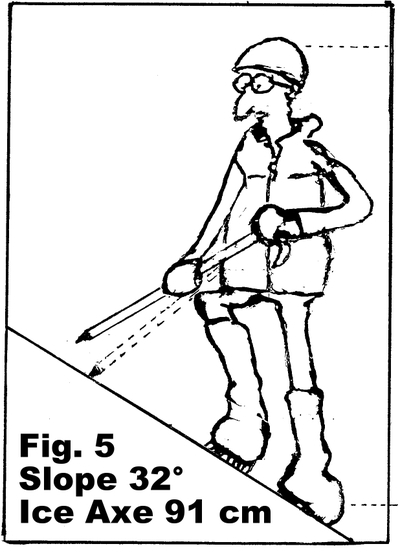 Although the axe is actually stretched out to about 83cm, what is portrayed is a most awkward, tiring, and, for many, an unsustainable, knees-bent position where control on such a steep slope would be difficult anyway. At least the Seattle people didn’t even attempt to get the axe behind the body. A lot of fun can be had glissading in the standing position where run-outs are safe, and excellent control is possible with waist-length ice axes held behind. Although the 91cm axe could be marginally acceptable for bracing, as in Fig.5, such would not be the case in glissading, where the extra nine centimetres makes a good position and good control significantly more attainable. 1.Mountain Craft, 1949 (7th Ed.) ,Geoffrey Winthrop Young, p.74-75. 3. Peter Graham: Mountain Guide, 1965, Ed.H.B.Hewitt, p.118. 5. Guide Aspiring, 1963, Frank Alack, Ed. J.H.Millar, p.137. 6. A Climber’s Guide To New Zealand Mountaineering Techniques, 2003, Guy Cotter and Mark Sedon, Adventure Consultants Ltd.
My diagrams for this article are drawn with acknowledgements to the lively figures created by Bruce Dowrick. 7. 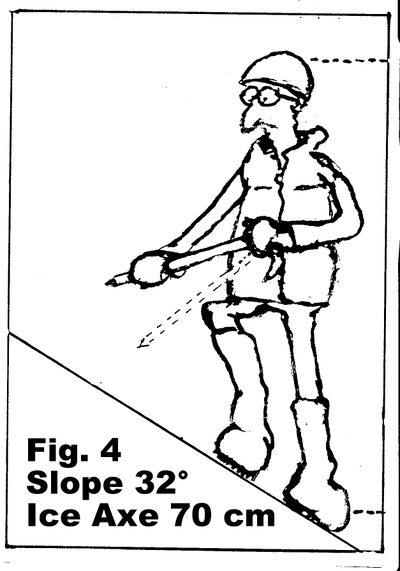 Alpine Skills; Mountain Safety Manual 34, Geoff Wayatt, Ed.Stu Allan, NZ Mountain Safety Council. 8. Mountaincraft, Mountain Safety Manual 20, 1987, Lindsay Main, NZ Mountain Safety Council. 9. Climbing High, 1999, Lene Gammelgaard, p.171. 10. A memorable photo in “Peaks Packs and Mountain Tracks” by W.Scott Gilkison, 1940, p.63, shows four climbers on the summit ridge of Mt. Aspiring, each one of them alongside a full-length shaft belay into the snow. Figures 1-6. 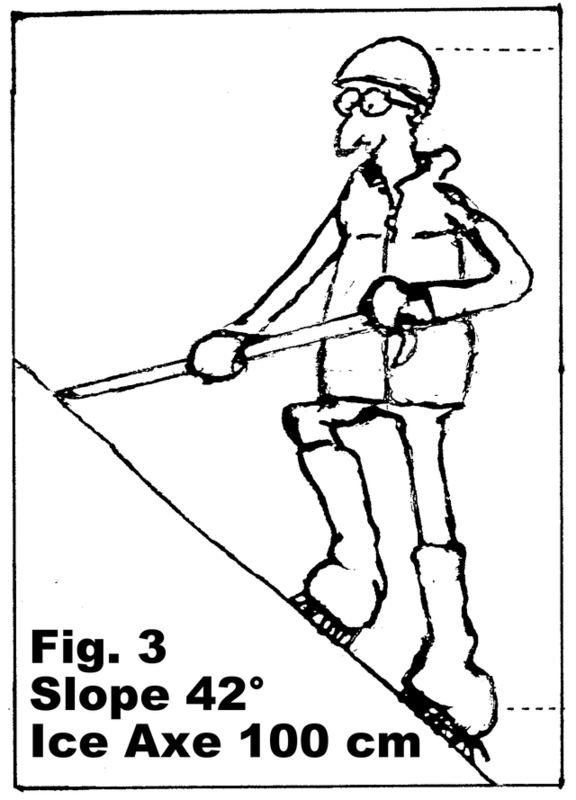 A climber of average height, 175 cm (between dotted lines), with ice axes of various lengths, drawn in proportion. Buck Knives recently moved from Southern California to Post Falls, Idaho, and continues to make knives of incredible quality and craftsmanship. I really like some of the new smaller knives. A Swiss Army knife is great for a lot of outdoor uses, but if you clean a fish with it you inevitably get all the blades dirty in the process, and its hard to clean out all those nooks and crannies. 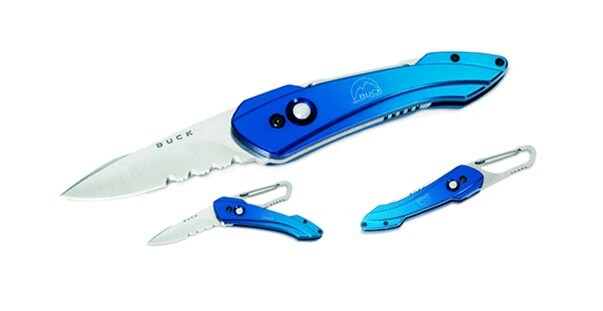 What you need is a one bladed knife with non-corroding parts, and the Buck Short Revolution is the perfect knife for that purpose. This knife has a blade that rotates to open or close it, so eliminates some internal parts that lockback knives must have. It has a clip built into the blade end that can be clipped to a belt, pack or to a leash from a fishing vest or pack. A release button releases the blade from the open or closed position. Nice designs are simple ones, like this. 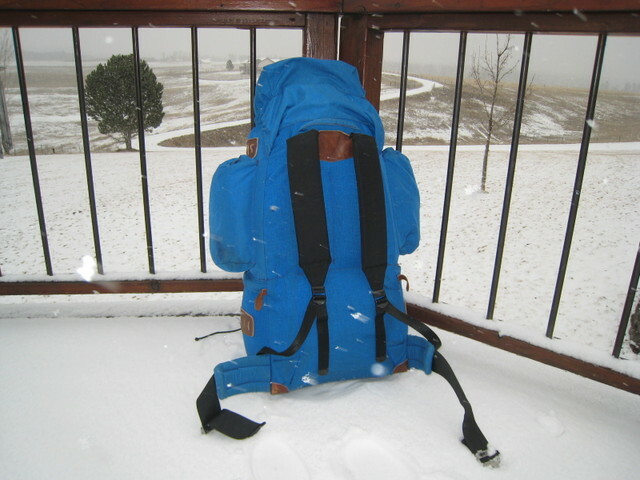 At 2.7 ounces, even an ultralight hiker won't mind carrying this. 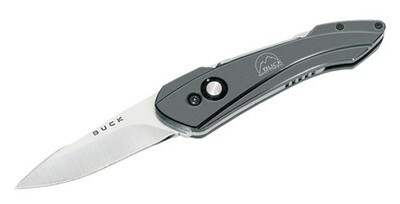 The Buck Knives homepage is here.